The Avg. Group Saves 18.8%! Check Rates1 King Bed Harbor View Park and Stay! Check Rates2 Double Beds Ballpark View Park and Stay! Check Rates2 Double Beds Executive Floor Park and Stay! Check Rates2 Double Beds Harbor View Park and Stay! Check RatesKing Ballpark View Park and Stay! Check RatesKing Executive Floor Park and Stay! Check RatesStandard 1 King Bed Park and Stay! Check RatesStandard 2 Double Beds Park and Stay! Hotel atached to Baltimore Convention Center via Indoor Skywalk, located directly across from Oriole Park at Camden Yards. 3-4 Blocks from Harborplace and attractions such as Maryland Science Center, National Aquarium, and USS Constellation. We were in the area for a dance competition. We found the staff to be courteous and professional. The hotel's proximity to the convention center eliminated the stress of finding a parking space. We'd stay here again. 18-Mar-2019 Verified Review, stayed from Fri Mar 15 to Sat Mar 16 2019 at a $174.38 average nightly rate. "Exemplary service from staff at this great property in Baltimore"
We stayed at this property Oct 12 14. We booked approximately 25 rooms for my son's wedding through sales representative, Evan, who made the process so easy. The hotel rooms were roomy and very clean, with all the expected amenities. Guests facing Oriole Park were particularly impressed with the view. My room was on the 18th floor with easy access to the concierge lounge. The food there was great. I was very impressed that Hilton keeps this room open on weekends for elite plan members. I also want to single out the receptionist, Kei, who was very helpful the entire weekend. Finally, we appreciated the staff at the hotel bar for accommodating us for the after wedding party on Saturday night. All in all, this was a great weekend. We are glad we chose the Hilton for our out of town guests who came to town for the wedding weekend. 15-Oct-2018 Verified Review, stayed from Sat Oct 13 to Sun Oct 14 2018 at a $159.00 group rate (11% discount). The Hilton Baltimore opened in August 2008 and recently received its Three Diamond status. We have also been awarded MeetingsMedia's 2009 Best in the East Award and the 2009 Hilton Worldwide CONNIE Award for Outsanding Facilities and Service. Our new hotel is located in Downtown Baltimore amidst all the action, with the World Famous Inner Harbor just steps away. We also offer breathtaking views of Oriole Park at Camden Yards from our Meeting space and guestrooms. Our Hotel boasts 757 guestroom, 20 Suites, 60,000sqft of flexible meeting space inlcuduing our 24,379sqft Key Ballroom - the larget Hotel Ballroom in the city. It is also very Eco-Friendly with a 30,000sqft living, "Green" roof. The Hilton Baltimore has a 30ft two lane track pool. We allow pets up to 75 lbs. There is a $75 non-refundable pet deposit per night. BWI - Baltimore/Washington International located 8 miles from Downtown/Inner Harbor. Current pricing is $30.00 one way via taxi. Local Shuttle Info: Super Shuttle Service available. With option guest can enjoy room service in the comfort of their guestroom for breakfast or join us in our hotels restaurant the Diamond Tavern for a fresh cook to order breakfast. 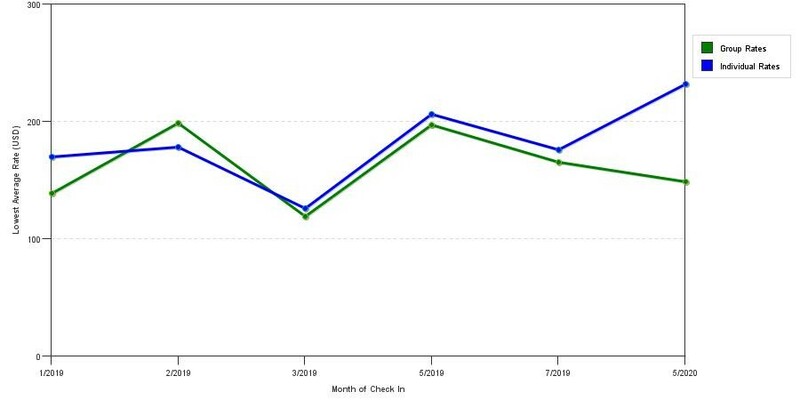 The chart above shows seasonality of prices for both group/meeting rates and the best individual traveler rates our rate checker could find at the time the group bid was placed. The most competitive group rate shown is 39.1% in April 2018 and the highest average individual rate is $282 in the month of May 2017. This chart will show past seasonality and also project future months. If you are flexible with dates, you may want to consider staying at Hilton Baltimore Convention Center in a month when rates are lower. 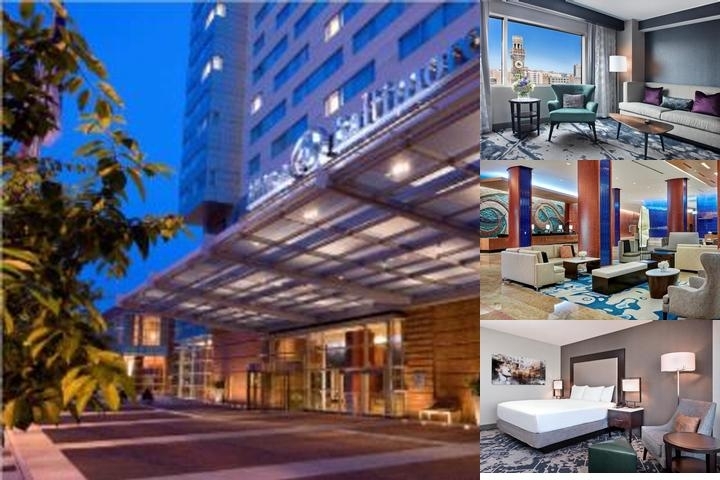 Below are the meeting, banquet, conference and event spaces at Hilton Baltimore Convention Center. Feel free to use the Hilton Baltimore Convention Center meeting space capacities chart below to help in your event planning. Hotel Planner specializes in Baltimore event planning for sleeping rooms and meeting space for corporate events, weddings, parties, conventions, negotiated rates and trade shows. The Key Ballroom divides into 12 sections. An additional 19,000 square feet of pre-function space is available with floor to ceiling windows and a fantastic view of Oriole Park at Camden Yards. 212 x 126 x 21 Ft.
24 x 28 x 14 Ft.
27 x 25 x 9 Ft.
22 x 34 x 14 Ft.
27 x 21 x 14 Ft.
31 x 33 x 14 Ft.
39 x 20 x 12 Ft.
37 x 24 x 13 Ft.
28 x 25 x 12 Ft.
27 x 34 x 14 Ft.
24 x 21 x 14 Ft.
32 x 43 x 14 Ft.
35 x 18 x 14 Ft.
22 x 21 x 14 Ft.
39 x 40 x 12 Ft.
26 x 21 x 12 Ft.
32 x 33 x 14 Ft.
39 x 21 x 12 Ft.
171 x 90 x 26 Ft.
30 x 21 x 14 Ft.